The first week of October I received an e-mail from Lauren at ALDI Hq, inviting me to attend the Aldi Test Kitchen event along with 8 other bloggers. We were to come visit ALDI Headquarters courtesy of Weber Shandwick and ALDI! I accepted...and had an amazing time. I learned so much about ALDI and I am here to report all of my information to my readers. If you have been curious to know how ALDI can give us cheap food without cutting the quality (they really don't cut quality) then you need to read this post because it contains all the secrets of ALDI. It was the funnest ride I've ever been on. If you haven't flown, try it once. Especially if you like carnival rides! When I landed in Chicago, I met Nicole from Nicole's Nickels, and together we rode in our Music Express town car to our hotel, The Herrington Inn & Spa! An hour or so later we arrived at our hotel and checked in. All the bloggers were there but I only met Nicole so far...and she is amazing!! Love her!! Our schedule said to meet in the lobby at 3:40, so I had a couple hours to kill before heading to the Aldi test kitchen and Aldi headquarters...what did I do for a couple hours? Please visit their wonderful blogs if you have not done so before! First we visited the Test Kitchen and tasted ALDI products compared with National Brands. I preferred ALDI brands 8 out of 10 times without knowing which brand was which! And the 2 times I preferred the National Brand, the two tasted very similar. Definitely similar enough for me to buy ALDI and save up to 50% off my grocery bill! It's just SMART! After testing we went into the next room for our holiday feast. Before that though, we met Janice Stahl, a food stylist who has worked with companies such as Butterball and Kraft, whom I was very impressed with! She taught us money saving secrets and decorating ideas to save time, money, and energy when we entertain our friends! Read my full post on everything we learned HERE. Finally, the test kitchen chefs came in and we got to EAT!!!!!! Ham, Turkey, Sauces, Treats, Stuffing Balls, Green Bean Casserole, and much more! We were soooo full and sleepy after dinner! You can find the recipes of my top picks from everything I ate during my trip HERE. Upon returning to my room, the fireplace was turned on, I had a chocolate bar and the Christmas ad from Aldi on my desk. I also had ice cold milk and a chocolate chip cookie from the hotel. I enjoyed a hot whirlpool bath and fell asleep quickly afterwards in my amazingly soft bed....zzzzzzzzzz...can I go back now? The next morning I met the other bloggers downstairs for a yummy breakfast! Have I mentioned that I stayed full from the moment I got there until I left? Lol! I should have known coming to the Aldi Test Kitchen event that I would be well fed. The first thing we did was met the Vice President at the Aldi store for a tour and an explanation of how Aldi cuts prices, without cutting quality. IT'S TRUE!! They have the minimum amount of staffing needed. The cashiers do the stocking, etc. The packages have more than one bar code on them! This also takes time when a cashier has to weigh products, pay attention next time, produce is sold by the unit, not the weight. This allows the cashier's more efficiency in their job as well! They don't use fancy shelves. As I mentioned before and as you probably know, the shelves are the boxes the product comes in. The carts for the milk and eggs are the carts that come off the distribution truck. They are not transferred to other shelves and carts. This allows for quick exchanging. They make their own products and do not have to pay other suppliers. Many grocery stores have to their suppliers, Kraft, Kellog's, Miller, etc. brand names. Aldi makes their own products with many times, the same ingredients, and many times from the same places other brands get their ingredients from. This is what the purpose of the test kitchen is. They test each new product to ensure the taste and quality is as good as national brands, or better, before they package and approve it to be sold in ALDI stores. Kudos to you ALDI's!! No one has to collect the grocery carts, or bag the groceries. They don't need to pay extra staff to do this because of their quarter cart, and bag your own groceries systems that are in place. It's worth cutting your bill in half, to bag your own groceries. Plus, you only need to buy the bags once, because you can reuse them. Feel free to bring in any type of bagging you need to your ALDI store. It doesn't have to be ALDI brand bagging. They use re-usable labels for their price tags. The price tags on the merchandise in the stores are an instantly changeable tag, notice in the photo to the right above. With a few adjustments to the tag, you can change the price instantly. No expensive printing or purchasing of tags of all prices possible is needed. There are also various other reason to shop at ALDI. Their milk is always the lowest in your area. Challenge yourself to find cheaper milk without the use of coupons, at general retail price. You won't. In Chicago the milk was 1.88 a gallon, and here in St.Louis it is also around 2 bucks for me. Their milk also contains no growth hormones, and no BGH. Their produce goes through quality checks at the distribution center, and then again by ALDI employees while they are stocking. Also, If you don't like your product, return it for a full refund---no questions asked!! Aldi Truth #10: Impressively high quality at impossibly low prices!! After all of that, even more exciting things happened!! We were told we would be going back to the test kitchen to take on a recipe challenge....DUN DUN DUN!! It was announced that it would be Guacamole and we had a list of ingredients back at the kitchen provided for us. It was our challenge to get creative and come up with one secret ingredient to add to our recipe. It felt like Top Chef! We ran through the store and picked 1 ingredient. I chose one of my favorite ALDI items, the Feta Cheese crumbles. Have I mentioned how wonderful this women is? I enjoyed sharing my trip with her! Very funny and lovely! We enjoyed a taco bar for lunch provided by ALDI, and said our goodbyes...*sniffle* I really felt like the trip was one of the most honorable moments in my life to meet the ALDI HQ staff, test kitchen chefs, and some of the most intelligent, independent and amazing women I have ever met in my life!! Whom all were very friendly towards me, welcoming, and caring....considering I was the most amateur blogger out of the bunch in all honesty!! Thanks ladies for not picking on me, and instead befriending me and giving me tips for how to better my own blog here at AldiMom.com. Every tip you all gave me will help me in the future. I would also like to thank Lauren Acosta with ALDI, without her I would have been completely lost on this trip. My first time flying, my first time going on a trip alone, and my first time meeting other bloggers like myself. Every question I had she responded quickly and helped me not lose my head during the trip. I would like to thank Weber Shandwick and ALDI for giving us all this opportunity to visit the Aldi test kitchen and Aldi headquarters. You all did an amazing job planning everything, and thank you for the gifts and everything else!! :) How could I love ALDI even more than I already did??? But, I DO!! Great story, but I had heard alot of it from my "Furnace Guy". 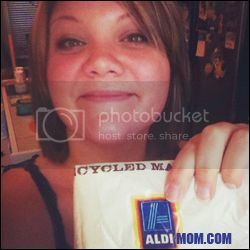 I buy about 80-90% of my groceries at Aldi and love their stores. Really nice web site ! I'm always convincing people to try their stores and products. This was an amazing experience to be taken through the process of Aldi. I have shopped there for about as long as they have been opened. I think it has been nearly 40 yrs or more. The products have gotten much better since the beginning, though some have survived the test of time. Now I have a question for you. I was knocked off my feet to learn Fit&Active is Aldi's own brand. Their drinks are the bomb as well as all the other Fit&Active products I have tried, that has been many, including that excellent spaghetti. So, I discovered it was Aldi's brand while attempting to purchase a case of the drinks. Since you are connected in some way, my suggestion is that they also sell mixed drinks grape, peach, etc. all in one container so customers can test all the different flavors. I have everyone buying that stuff now. Second, it would be great if we could purchase them in larger packages or even order a case if we would like. I buy many of them when I go, yet it never seems to be enough, particularly since I am always letting people try it. Believe me, they leave my house and go right to Aldi and purchase some.